Last Tuesday a group of about 20 took an all-day trip to Apple Valley, California to visit a Wal-mart Distribution Center. Touring this Center required about 12 hours of riding and flying, but that’s another story. We went to Apple Valley (near Barstow) to see a Wal-mart Distribution Center (WDC) in operation. Why? Because Wal-Mart wants to build a similar Center here in Merced. And it’s a big deal. The new Distribution Centers are the size of 24 football fields–under one roof. They have 1.3 million square feet of space for products sold at Wal-mart. Each center services about 70 individual Wal-mart stores. When the WDC opened in Apple Valley they had 12,500 applicants who showed up to grab one of the plum jobs. 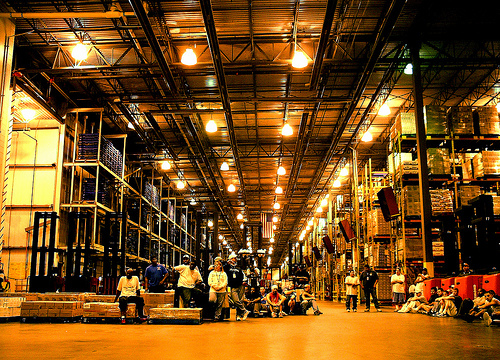 If you don’t have a job or health care these Distribution Center jobs look like a godsend. What’s curious to me is the loud opposition to the Center that we’re now hearing in Merced along with the seriously flawed disinformation that is disseminated by the opposition. For example, our tour group expected to see queues of trucks waiting to either load or unload at the Center, belching clouds of CO2 and black smoke. In point of fact, most days only 70 trucks come to the Center. These are state-of-the-art trucks that don’t idle when parked and use the most fuel efficient engines available. But I allowed myself to get distracted. Which is what much of the disinformation does. It takes our focus off of the people that need the 900 jobs that will be generated by the WDC. That’s 900 jobs making $17 an hour with excellent medical benefits. That’s $35k jobs in a County that has a per capita income of $14,257 as reported in the 2000 Census. (Citation: http://quickfacts.census.gov/qfd/states/06/06047.html). In all this community debate about the WDC I couldn’t help but think about how God condemned ancient Israel for ignoring the plight of the poor. I know that the issues surrounding the WDC are complex, but it seems to me that if we began with the poor, much of the other debate would become clearer. Victorville Daily Press reporter Nikki Cobb attended the grand opening of the Apple Valley Distribution Center. Here’s what she wrote. “W-A-L-M-A-R-T!” The 27-acre Wal-Mart distribution center — with room enough to fit 24 football fields under its roof — was barely big enough to contain the enthusiasm of the jubilant employees and local dignitaries assembled for its official grand opening Tuesday. I’m sure there would be similar cheering if Merced put 900 of it’s citizens to work. (Apple Valley WDC has about 1000 employees.) And that would begin the process of raising our per capita incomes to more humane levels. I daresay that God would be happy.